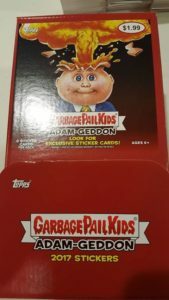 In the first post we looked at how many packs/boxes/cases were produced of 2017 Series 1 Garbage Pail Kids Adam-Geddon. Here’s a review of what we came up with. Still there are some things we just can’t determine. Topps has made it tough on us in recent releases. They no longer share a lot of information on the sell sheets for insertion numbers. This means we can not figure out each different retail pack type. Therefore, there are many retail items that we are unable to determine the production on. For example, the Yellow Pee borders. 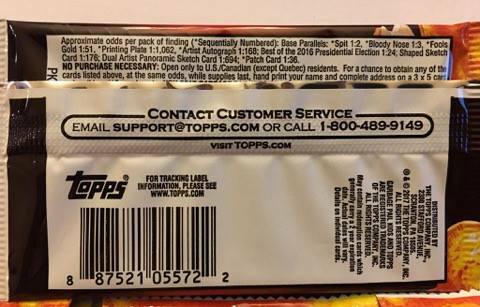 Since there is no way to break out the number of gravity feed packs from the other retail packs, we can not determine how many Pee borders were made. This also true for the various retail bonus sets; Classic Adamgeddon, Gross Bears, and Bathroom Buddies. However, with production down 28% compared to Prime Slime, there will be a lot less of these sets. The lack of retail breakdown also means we can not determine how many Loaded Sketches or Panoramic Sketches were inserted into packs. While we can’t figure out the Yellow Pee parallel, we can determine how many of the other two non-numbered parallels were made. We can also find out how many of the Best of the Presidential Election bonus inserts were made. Bruised Borders – 36,000 Collector packs X 1 Odds (doh) = 36,000 total Bruised borders / 180 cards in set = 200 per card. Puke Borders – 423,000 Retail packs X 1 Odds (doh) = 423,000 total Puke borders / 180 cards in set = 2,350 per card. Best of Presidential – 36,000 Collector packs / 24 Odds = 1500 total cards / 10 in set = 150 of each card made. Some very interesting things to point out in those numbers. Because there are 1000 more Collector packs compared to Prime Slime, there are actually more Bruised cards this time. However due to production cuts in retail there are now less Puke cards. Perhaps the biggest different is in the Best of Presidential “Bonus” cards. In previous sets you would get one card per Collector & Hobby box. With Topps chasing Hobby boxes to match retail the cards were only available in Collector boxes this time. That means more than a 40% cut in available bonus sets with this release. There can only be 150 Bonus sets possible this time. These cards might dry up quickly. One thing I always find interesting is to determine what pack types the printing plates and artist autographs are hiding? Retail always had the majority of the plates because over 80% of the production is retail. We know Topps inserted 360 plates into the production, so here is the breakdown of how many can be found in each pack type. First an explanation on why the numbers for each are higher that they should be. If you remember back in Part 1 of our discussion, I talked about Topps chasing the odds on Jumbo Retail packs this year. Previously the odds would be halved on everything for Jumbo packs, therefore a Jumbo pack would count as 2 packs. However, this time for Plates and Autos that is not the case. Our pack number of 423,000 assumes Jumbos as 2 packs, this is why the numbers come out a little bit more. I think the main thing to point out here is plates will be few and far between in Collector boxes, this is a change from previous releases where they fell at a much higher rate. Shaped Sketches – 36,000 Collector packs / 178 odds = 202 Shaped Sketches in Collector packs. Dial Artist Panoramic – 36,000 Collector packs / 694 odds = 52 Dual Artist Panoramic Sketches in Collector packs. A couple of things stand out right away. Hobby boxes no longer contain Shaped Sketches, therefore there is more than 60% fewer Shaped sketches in this release. Dual Artist Panoramic Sketches are cut by almost 50% compared to Prime Slime. This matches information shared by the artists when they began drawing the sketches. They were giving far less to draw for this release. Looking at the numbers for Adam-Geddon really tells a story, but also leaves many unanswered questions. Production was cut way back compared to recent sets. Is interest falling in retail GPK sets? Or is this just distributors over correcting because of over ordering on Prime Slime? 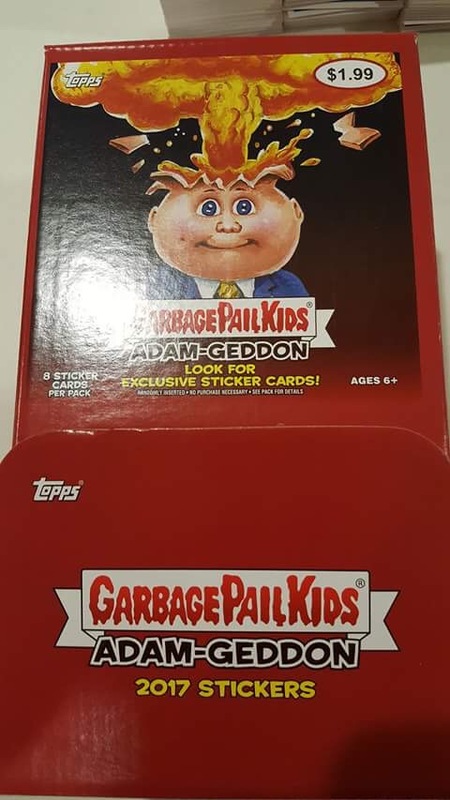 Topps has yet to announce the next retail GPK set. It will be interesting to see how the smaller set size coupled with the lower print run affects the next GPK set. Base Cards – (36,000 Collector packs X 6 cards per pack) + (423,000 Retail/Hobby packs X 7 cards per pack) = 3,177,000 Total Base Cards produced / 180 cards per set = 17,650 Total of each base card. While that’s a ton, its down from over 25,000 of each Prime Slime card. Get those sets while you can!! !